After the conference closed last night I took Singapore’s efficient MRT to Little India. This enclave is just what the name implies – a concentration of all things from India. Exit the MRT at Little India station and follow the signs to Tekka Market. This two-story public market has stalls for fresh meat, seafood, vegetables and more. The central courtyard is jammed with food stalls selling numerous prepared dishes. On the far side you exit the market onto Buffalo Road. 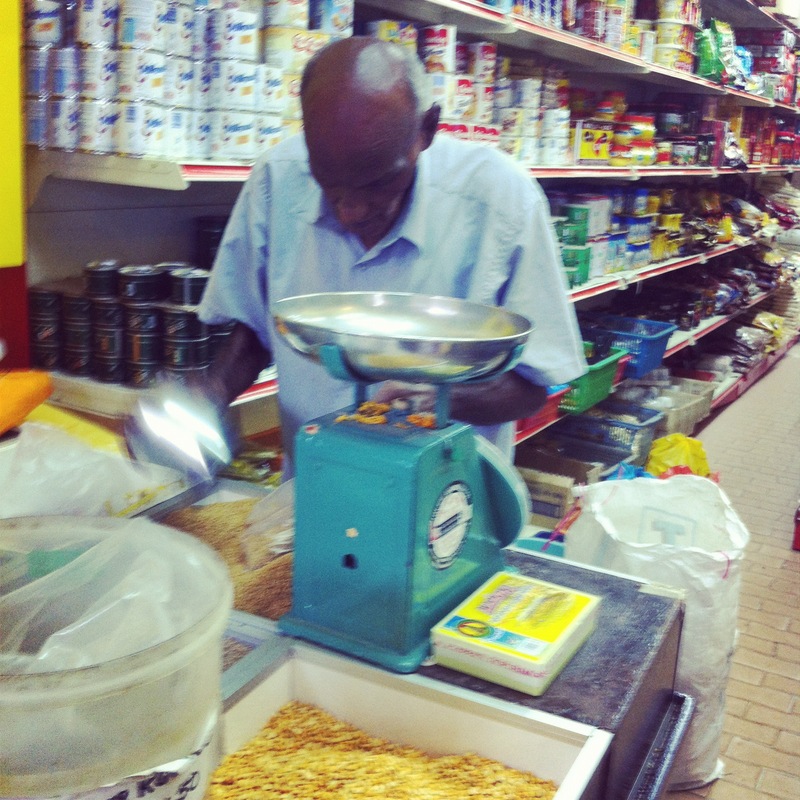 Cross over to see some of the garland sellers and numerous dry goods stores. 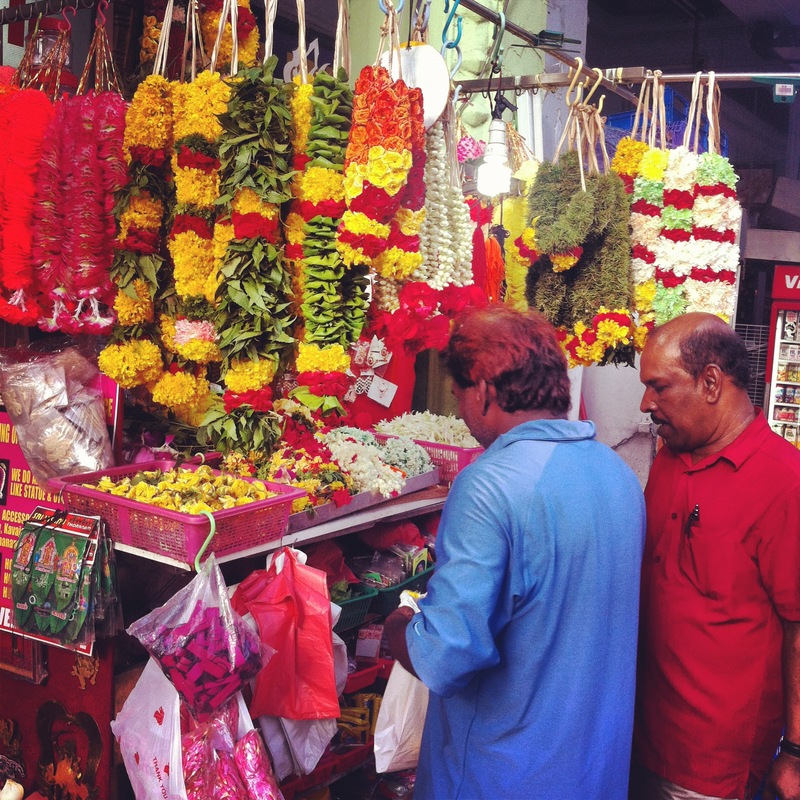 Walk down Buffalo Street (right out of Tekka Market) and cross Serangoon Road. This busy throughway is best navigated in the wake of locals. They can time the taxis and buses and cars with ease. From here enter the labyrinth of small alleys like Cambell or Dunlop. Stores have wooden carvings, embroideries, foodstuff and spices. I went into Thandapani Co. General & Provision Merchants with a long list of spices. At home we are fortunate to have good cooks from Sri Lanka. I needed Cumin and Fennel and Mustard seeds – then fresh curry leaves and lentils and chili powder. An elderly man known by the honorary title of Uncle served me. He measured and found everything on my list. The final bill was high but I had a few expensive items – like whole nutmegs and peeled pistachio nuts. I got everything except whole vanilla beans. Seems they’re not frequently used in Indian cooking. 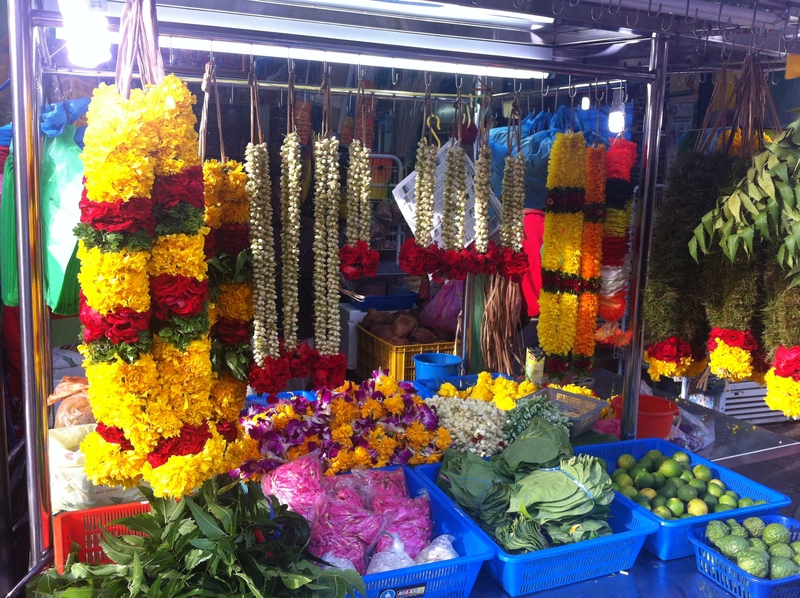 On my way back to the MRT through Tekka Market I grabbed bunches of fresh curry leaves – sold on the branch, three for 50 cents. From there it was back to the main street for tea, curry and more. More Garlands? Red to match your hair? 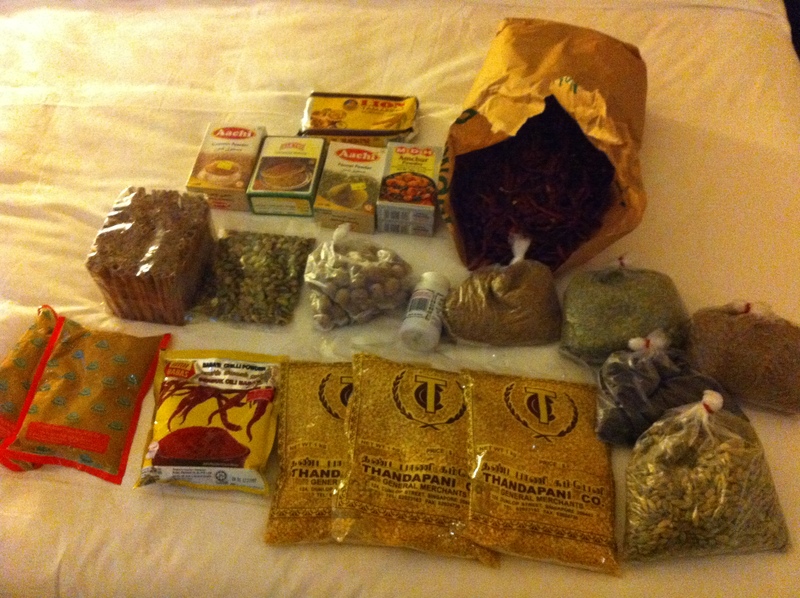 Today my hotel room smells like a spice bazaar – which is exactly where I’d been. The hotel concierge was proud to see his instructions met with such success. I’m now struggling to figure out a way to get it all home without asphyxiating the planeload of passengers. I am sure my luggage will smell better than any other return trip made! They are readily available in HHK.